Have you ever noticed that people sometimes argue in ways which seem do not seem to correspond to reality but which, instead, only seem to serve their own interests? You probably have. Psychologist refer to this phenomenon as motivated reasoning. Motivated reasoning is reasoning in such ways that your own beliefs, interests, behaviors, and goals are served. It is not something which only some people do. We all do it, sometimes consciously, often unconsciously. In the way we reason we often argue in directions of conclusions which we like to believe because they correspond with certain interests we have. These interests influence how we come to our conclusions in several ways. They influence how we gather information and evidence, how we process information and evidence, and how we remember information and experiences (Eply & Gilovich, 2016). 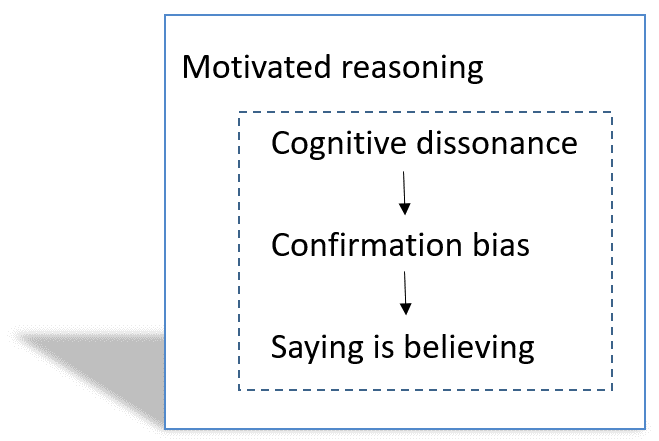 Motivated reasoning is associated with two other well-known concepts from psychology: cognitive dissonance and confirmation bias. Cognitive dissonance can trigger the proces of motivated reasoning and confirmation bias is an important way in which in happens. Cognitive dissonance is a concept which was discovered by Leon Festinger (1957). Briefly, it means the following. People act in accordance with their beliefs. When we encounter information which conflicts with our beliefs (and therefore with our goals and actions) a psychological discomfort (cognitive dissonance) emerges which we want to get rid of. This process of reducing cognitive dissonance happens by is avoiding situations and informations which create it. Confirmation bias means that we tend to search for and give weight to evidence which supports our previously existing beliefs. We notice this type of information better (this is called selective perception) and we remember it better. It happens largely unconsciously. And even when it happens consciously we do not realize in the first place that it is a bias. Motivated reasoning can happen consciously and it often does. Politicians who pivot and palter, for example, often do this deliberately (example). A problem is that it also often happens unconsciously. This has to do with the previously mentioned confirmation bias but it can also happen because of other psychological effects such as the saying-is-believing-effect. If we speak out beliefs and repeat them often we start to believe them more and more, regardless of how true they are. Motivated reasoning can be seen in the way that people usually refuse to acknowledge mistakes. This phenomenon is extensively described in the book Mistakes were made, but not by me. Again, this tendency to always want to justify our own beliefs and actions is not reserved to politicians. We all do it and often without us being fully aware of it. By spreading knowledge about these types of effects we may decrease their harmful consequences. We can teach people to protect themselves to some extent from confirmation bias by training their rationality and critical thinking skills. These are skills which deserve more attention in schools, I think. But, on an individual level, motivational reasoning will probably never be completely eradicated. Collectively, we have a better shot. By institutions such as democracy, an independent press, an independent judicial system, and science, we can reach conclusions which are, to a lesser extent, distorted by partial interests. The downside of promoting the concept of motivated reasoning is that social justice warriors use it as a means of attacking the person instead of attacking the argument. It's common to hear things like "You are a privileged cis-white male and you are only saying that to entrench your ability to oppress others." We need to balance the revealing question "cui bono" (who benefits) about an argument, with a need to respond to the argument on its own terms. A privileged white male may have arguments that are correct; and showing they benefit from the argument does not in any way invalidate it. Hi David, Thank you. Good point and a useful reminder, here! You and I talked about these issues before and I agree with you. We must respect truth, in other words, reason, logic, and evidence. We should judge arguments on their merits. We should strive to override our tendency of motivated reasoning.